During the event, which was witnessed by parents, students and community leaders, the Independent Electoral Office (IEC) congratulated the NWU’s student populace in Vanderbijlpark for their participation in the election process. This year saw students take to the voting stations electronically – a first for the campus in Vanderbijlpark. “The electronic voting system used is regarded as one of the best in the world,” said Kim Groenewald, an IEC official from the Sedibeng IEC Office, and added that the new cohort of leaders will go down in history as the first campus leaders to emerge victorious from a paperless election. 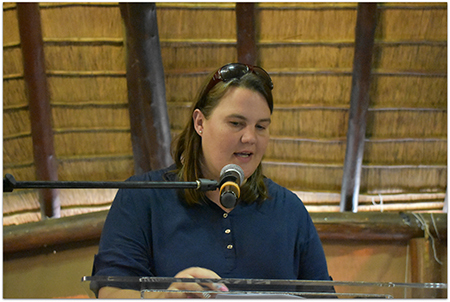 In her address, Prof Linda du Plessis, the deputy vice-chancellor for planning and campus operations in Vanderbijlpark, said that the inauguration of new student leaders remain a highlight on the campus’s events calendar. “Each group of student leaders represents a new chapter in the story of the NWU, and therefore we welcome them into office with high expectations,” said Prof Du Plessis and added that student leadership goes hand in hand with responsibility and accountability. “Assuming any leadership position is a precursor for students to build their portfolio and capability to face the even greater responsibilities in the future. Now is your opportunity to build a leadership repertoire, learn and re-learn pivotal leadership skills,” explained Prof Du Plessis. 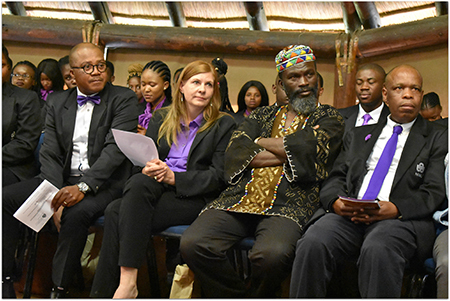 Attending the event was from left Zakhele Gamede, Prof Linda du Plessis, Joshua Maponga (motivational speaker) and Jacob Simango. Kim Groenewald, a representative of the Sedibeng IEC.